Please use our free shuttle bus services operating from”Mishima Station” and “Gotemba Station”. The shuttle bus is operated by Fuji Kyuko Co., Ltd.. There are two designs of buses that run on the two routes. Fuji Kyuko company color vehicle (Vibrant green with green line pattern) and other buses that have original designs of Gotemba Kogen Resort. Please board either bus, the destination is the same. You may also see the “Tokinosumika” sticker on the body of the bus. 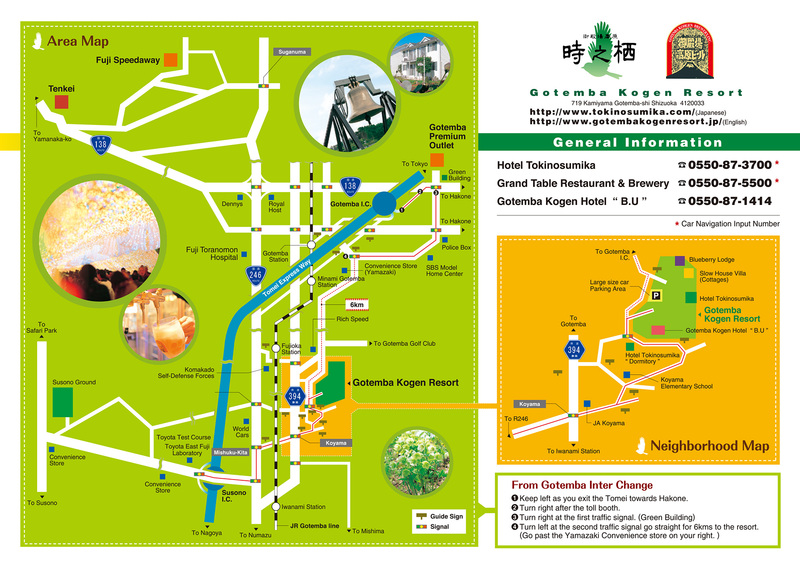 Just ask/say “Gotemba Kogen Beer” to the driver before boarding to confirm. Numazu city, Mishima city, Susono city, Nagaizumi town, Gotemba city, or, Oyama town. Please contact Bennett J.Galloway our International Sales and Marketing Director to coordinate this service. From Tokyo: Take the Tomei expressway (approx. 1hr & 15min) to the Gotemba interchange and just 10 min to the resort from there. From Osaka: exit the Tomei at the Susono interchange and just 5 min to the resort. From Yokohama: Transfer to the Gotemba Line at JR Kozu station. (approx. 40min to JR Gotemba Stn.) see free resort shuttle schedules below. From Tokyo: Take the Tomei Highway Bus (1540yen) from in front of the Odakyu Halc Dept. store in Shinjuku Stn. direct to JR Gotemba Stn. (approx. 1hr & 40min) Buses leave approx. every 30min! From either Tokyo or Osaka, get of at JR Mishima Stn. (just 1hr. from Tokyo stn.) and transfer to our free shuttle. (40min to the resort) see shuttle schedules below.